Summary: London. 1880. In the slums of Spitalfields apprentice blacksmith Luke is facing initiation into the Malleus Maleficorum, the fearsome brotherhood dedicated to hunting and killing witches. 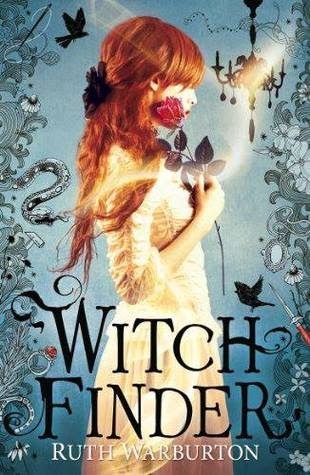 Review: Witch Finder brings together two characters who seemed trapped by expectations - Rosa, whose family has fallen upon hard times after the death of her father, and Luke, whose family was killed by a witch and left him broken and intent on revenge. There is a lot that is predictable about this book, but in spite of that I quite enjoyed it. The writing flowed well, and the descriptions drew me in and carried me through it, even though there were certain turns to the plot that I could see coming a mile away. I couldn't help but empathise with Rosa, especially when everything about her appealed to the feminist in me. It reminds me a bit of both Cinderella and Beauty And The Beast - the girl who wants more, who is in conflict with her family and struggles against the expectations of society. Rosa is headstrong but loyal to her family even when they don't deserve it, but not afraid to stand up for herself, either - I quite liked her as a character. I will say that I knew where the plot was leading as soon as I opened the book and started reading, at least in terms of Luke's ultimate connection with Rosa. Again, I wish it had developed a bit slower - I'm not sure why so many writers seem to rush into things. Maybe it's because they want to have the hook of the romance in the first book to keep people coming back? To be honest, however, I am more likely to come back for a romance that's well written and still developing than writing that shoves the characters together. Sebastian is something else entirely, but I found him fascinating. I saw the truth about Sebastian's family and the way he connected with Luke's long before it was revealed, but it was a pleasure to have this darkly charming, dangerous character be revealed for the horrid person than he was, rather than someone to be swooned over. Rosa knows that he's dangerous and stands up to him and his behaviour, rather than accepting it. I do think that the lack of more information about the society that the characters live in was a major letdown for this series. There was so much that I wanted to know - at times it seemed as though the characters live in hiding, but then at other times, it seemed as though it's an open secret? Perhaps the upper society are all the ones who have magic, and the lower castes are without, but the fact that I'm not sure points to the weakness in the plotting. The elements for a fascinating arc are all there, they just need to be more tightly drawn together. Definitely some ups and downs for this first book in the series - but I will check out the second one, when it comes out. There's some potential there that I'm still willing to check out. Disclosure: A copy of this book was provided through Netgalley in return for an honest review.